March 30th might be a long time away but we felt we had to get this brilliant poster up as soon as we saw it. 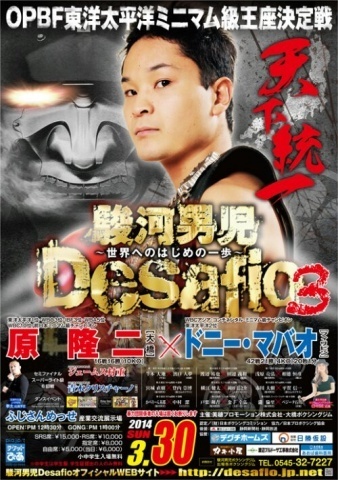 The poster, for "Desafio 3", which oddly translates from Spanish as "Challenge 3", if for the show which features the unbeaten Ryuji Hara fighting against Donny Mabao for the vacant OPBF Minimumweight title. Whilst the poster doesn't feature Mabao's image at all and it does force you to focus on Hara it's still an amazing poster with the face in the background giving the poster a chilling feel that really looks fantastic. Unfortunately the writing at the bottom is lost on us with out limited Japanese though that is our only complaint about the poster which caught out eye earlier today. Well done Ohashi gym for this one!